I owe you an apology. Maybe I just woke up from a very long winter's nap? With very little cold weather, but still with no leaves on trees, if it's below 50, I just want to do nothing. And that mindset seems to speed up time without me really knowing what I've done. My apologies for waiting almost three weeks to do my final plantain post. (Not believing for a second that you have all been wringing your hands because I haven't, but I did promise a three part series...) These warm plantains with coconut and cacao nibs somehow lift me out of my seasonal disorder and make me feel a bit hopeful for beautiful places with the tropical flavors so I thought I would pass it along to you to help you out of the winter "blahs" as well. Besides lifting you out of the winter pit, there are lots of nutritional benefits as you have learned from the other posts. The first post about green plantains talked about the multitude of vitamins and minerals (AKA micronutrients) they contain. Then we learned about the many macronutritional benefits brought about by the micronutrients. This post is about the ripest, and therefore, sweetest version of plantains and will continue on this theme of benefits. 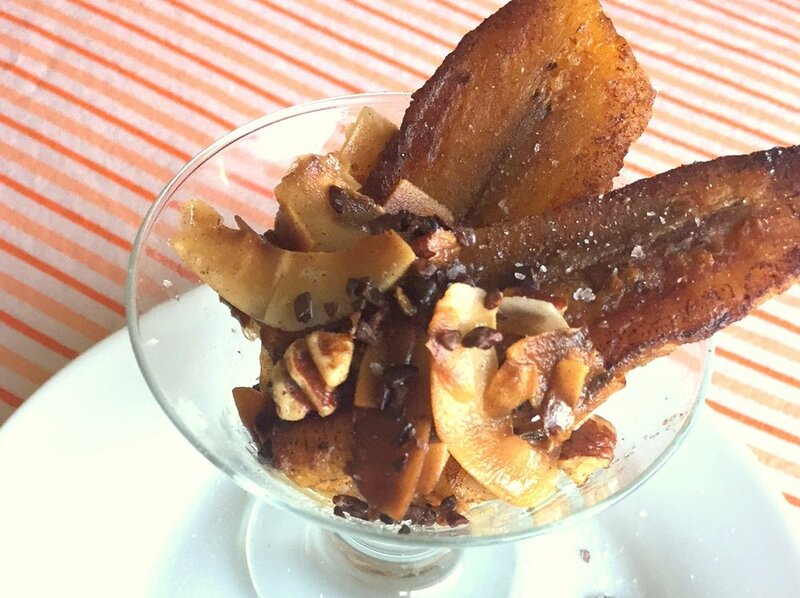 Keep reading to see step-by-step and full recipe for Dessert Plantains. If you want the complete low-down on plantains, read this great article by Dr. Josh Axe. I started last week with how the vitamins give you great benefits and this week I will finish this series with the macronutrients (i.e. fiber, magnerium, potassium) and the benefits they provide. FIBER FRIEND - Providing almost one-fifth of the 25-30 recommended grams of fiber a day, plantains are a delicious and grain-free way to consume fiber. Fiber not only helps aid the digestive functions and offer relief for hemmorhoids and symptoms of diverticulitis, but it also helps you feel full which may assist with losing holiday pounds. POTASSIUM POWERHOUSE - As with fiber, a cup of plantains provide one-fifth of the daily recommended allowance of potassium. Since potassium regulates digestion, heart rhythm and blood pressure, including plantains in your diet can greatly increase your levels of this important mineral. MAGNESIUM MAGNATE The Western diet is naturally low in magnesium due mostly to depleted soil. However, magnesium is very important to our bodies since it affects over 300 biochemical reactions in the body. Magnesium assists with calcium absorption, which in turn helps prevent osteoporosis. It also controls blood glucose levels which can help lower the risk of Type 2 diabetes. Plantains, in all their deliciousness, provide 16% of our daily essential magnesium, so go ahead make this dessert and get a healthy dose while you're at it. Now to the fun part...the making of this Paleo (and Whole 30 if you use ghee) dessert. Notice the plantains you will want to use look very black on the outside (and will feel quite soft) but once you take the skin off, they should still be slice-able. 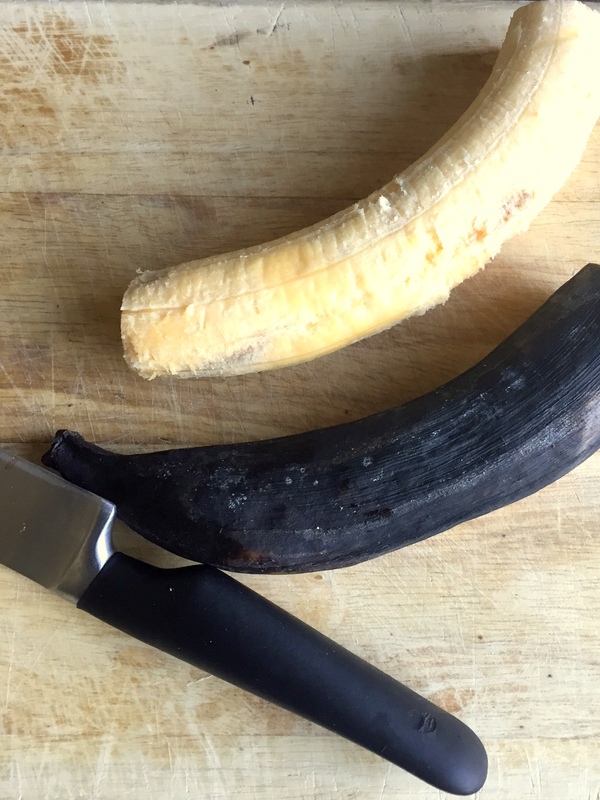 Peel the plantain by cutting off the ends and then making a shallow slit in the skin to help remove it. The darker the plantain, the easier the skin is to remove. Cut plantains in half lengthwise then again across to make 4 long pieces per plantain. Heat 3 tablespoons of butter or ghee in a large skillet (large enough to lay plantains in a single layer) over medium high heat until starting to brown around the edges then add plantains cut side down. 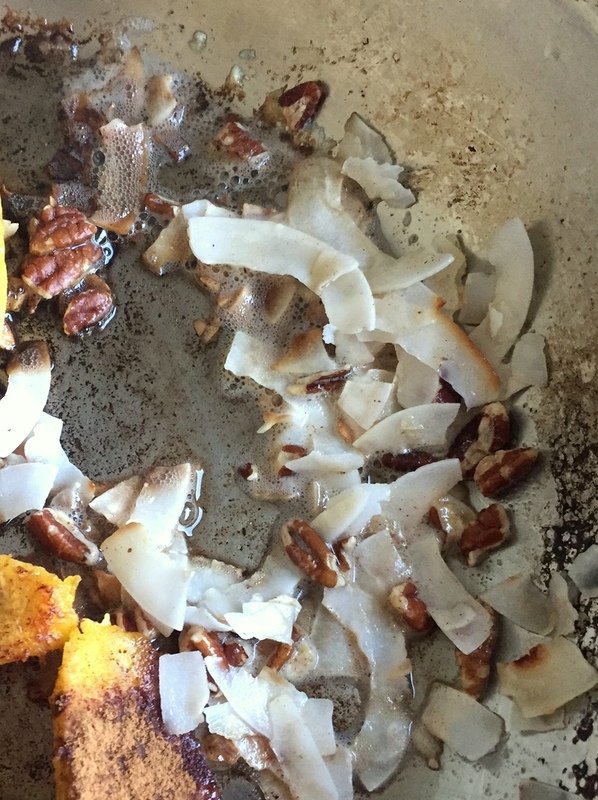 While the plantains are finishing up cooking, add coconut and pecans to the excess butter or ghee in the pan to lightly toast. 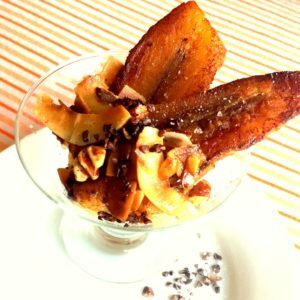 Serve the plantains sprinkled with sea salt and topped with the coconut pecan mixture and cacao nibs or cocoa powder. Peel the plantains and cut into lengthwise quarters. Melt butter or ghee over medium high heat until starting to brown then add plantains with cut sides down. Cook for 3-4 minutes then turn over and sprinkle cut sides with cinnamon. Allow the other side to brown then remove from pan. While the other side is browning, add the coconut and pecans to pan and allow them to lightly toast in any excess butter or ghee that is in the pan. Serve the plantains sprinkled with sea salt and topped with the buttery coconut and pecans and cacao nibs. If you don't have cacao nibs, you can lightly sprinkle with cocoa powder.